Welcome to the Michigan home of Topmast Golden Retrievers, Pat & Tom Swallows, and their Goldens. Tom and I have had Goldens since 1972, back when people would ask us if our first male Golden was "part Irish Setter"? Back when there were many people who didn't even know what a Golden Retriever was. We've been hooked on them ever since. In that time, we've had eight goldens. We currently have three female goldens; We lost our Abbi at 12 in 2013, and we have two of Abbi's daughters, Chime, age 9 and Kerri, age 7, and Chime's daughter Diamond, who just turned three. We love competing with our goldens and occasionally have a litter under the Topmast name, and done in close consultation with our breeder Gayle Watkins, of Gaylans Goldens . 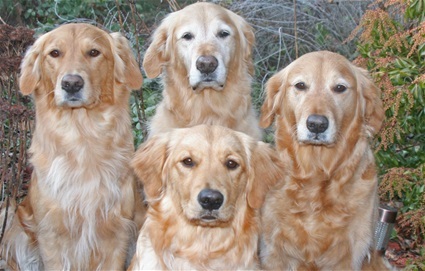 We strive to produce healthy Goldens with proper temperament, sound structure, and great work ethic. Our puppies are raised in our home with early neurological stimulation and socialization. I compete with my dogs in agility, obedience, rally, and field work. Tom does upland game hunting with all of them. Come on in and enjoy some of our favorite pictures of our girls, and some of our dogs of the past. 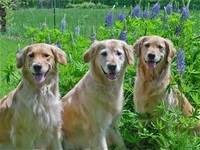 We have been a member of the Golden Retriever Club of America for the 40+ years we have had our goldens. Abbi and her two daughters Kerri and Chime.